A Robert Clune try set the side from The Rebel County on their way to victory. Cork Con's Gerry Hurley lifts The Bateman Cup. IN AN ENCOURAGING precursor to Munster’s Heineken Cup semi-final against Clermont Auvergne this evening, Cork Constitution captured the Bateman Cup following a tight 24-19 victory of St Mary’s College. Con’s Johnny Holland, with three penalties, and Robert Clune, a fine try in the right-hand corner, put the visitors 14-6 up against St Mary’s at their home ground, Templeville Road. The Mary’s response came from the boot of Gavin Dunne; his two penalties kept the Dubliners in touch on the scoreboard. Dunne kicked his side to within five points of Con as the half moved into its final 10 minutes but they would soon be standing under the posts as Holland slotted over a conversion. Scott Deasy, a member of the Munster senior squad, showed his class, and ran a fine line, to dive over. Con led 21-9 at the break. The home side fought back fiercely in the second-half and were rewarded for their toil when Gareth Austin dotted down. Dunne, who had slotted over a penalty only minutes before, added the conversion. Mary’s went through 14 phases in the con 22 as the game neared the final 10 minutes but unwisely, in retrospect, opted for a scrum when they had a penalty kick on offer. The ball was knocked on soon after and Con closed out the game smartly to claim the cup. Email “Cork Con survive St Mary's fightback to capture Bateman Cup”. 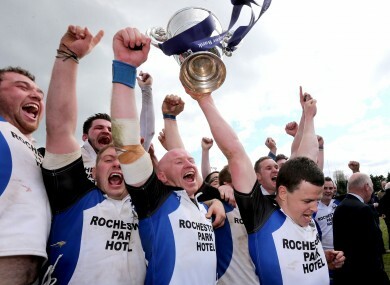 Feedback on “Cork Con survive St Mary's fightback to capture Bateman Cup”.